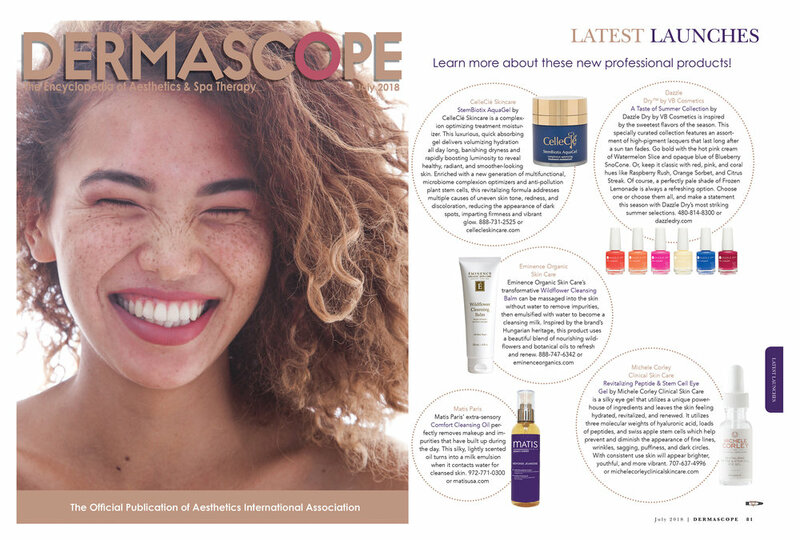 Michele Corley Clinical Skin Care's Revitalizing Peptide & Stem Cell Eye Gel was featured in Dermascope's July 2018 edition. Michele Corley Clinical Skin Care's Vitamin C Serum Plus was nominated in the 2018 Dermascope Asestheticians' Choice Awards. Read more about our Vitamin C Serum Plus by clicking the card on the left. Michele Corley Clinical Skin Care's Pore Purifying Cleanser was nominated in the 2018 Dermascope Asestheticians' Choice Awards. Read more about our Pore Purifying Cleanser by clicking the card on the left. Michele Corley Clinical Skin Care's Hyaluronic Plumping Serum was featured in Dermascope's May 2018 edition. Michele Corley Clinical Skin Care's Tinted Moisturizing SPF 30 was featured in Dermascope's April 2018 edition. Michele Corley Clinical Skin Care's Ultimate Performance Exfoliating Powder was featured in Dermascope's February 2018 edition. Michele Corley Clinical Skin Care's Pore Purifying Cleanser was featured in Dermascope's January 2018 edition. Michele Corley Clinical Skin Care's Purifying Oxygen Lotion was featured in Dermascope's January 2018 edition. Michele Corley Clinical Skin Care's Plump Me Up Hydrating Mist was featured in Dermascope's October 2017 edition. Michele Corley Clinical Skin Care's Vitamin C Serum Plus was featured in Dermascope's June 2017 edition.